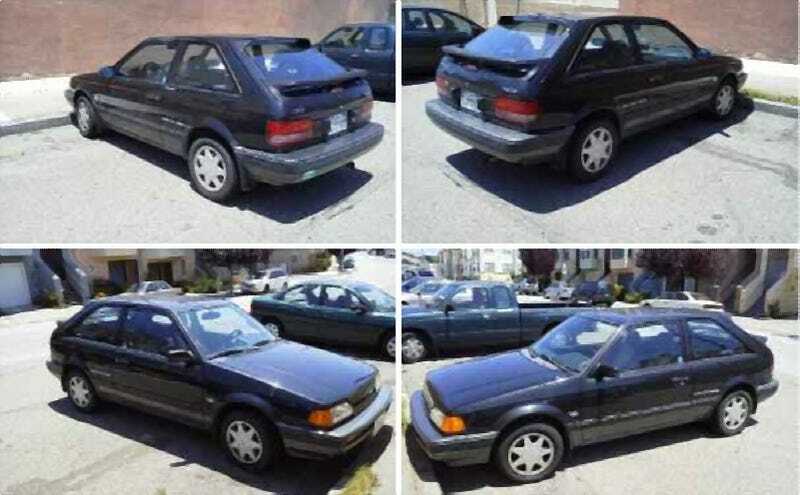 Mazda's 323 was the replacement for a small runabout the company dubbed the GLC, or Great Little Car. Today's Nice Price or Crack Pipe 323 is not just a real GLC, its turbo'd 4WD makes it a GTX, but will its price make it a POS? So, today we have a 323, and yesterday we had a 328, which obviously must be five better. How many better? Five better. It should be because its price was nearly ten times higher. That still didn't seem too egregious for the 85% of you who voted it a Nice Price win despite headlights stuck in the I just received a rear admiral position. At one point, Mazda thought they were in the position to spice up their mundane 323 series with a Red Bull-like jolt of Group A ralliness. The resultant GTX was made available in the US for only two years - ‘88 and ‘89 - but during that time it developed the kind of reputation that Joan Jett writes songs about. This 1989 323 GTX is the rally homologation gnarly branch of the Mazda Familia árbol. The FIA established Group A for modified production cars in order to engender for privateer teams a cost-effective entry into racing series'. The requirement was that the racers needed to be based on an actual production model which was built in sufficient number (5,000) to exclude factory teams one-upping the competition. This resulted in cars like the Subie WRX, Mitsu Lancer Evo, and Lancia Delta Integrale (genuflection required for that last one), which back in the day embodied compromises for the street that made them more effective on the track. Today, WRC Group A rules have changed and the cars that run under them are no longer constrained by the need to be sold to the plebeian likes of you or I. The 323 GTX never really made a name for itself in Group A, perhaps because, unlike Subaru and Mitsubishi, Mazda refused to go full racecar. The street versions of the contemporary WRX or Evo sported brakes and tires that lasted about three blocks and cost and arm, a leg, and three kidneys to replace. The GTX, on the other hand, was more cost effective as a streetable ride. That's not to say that it didn't pack some of the right gear - there is a 132-bhp turbocharged and intercooled edition of the 1.6-litre B6 engine which would also find its way, in naturally aspirated form, under the hood of the MX5. Bolted to that OHC four is a five speed manual which sends power to all four wheels through driver-lockable front diff and transfer case. In comparison to the hot Imprezas and Evos of today, that power and lack of sophistication may seem unappealing, but when it was new, these cars were like Max freakin' Headroom. This one appears to have time-warped to the present without suffering the typical indignities of its second tier status - lacking aftermarket wheels, bodywork or even once-was-witty bumper stickers. The seller says it has but 87,000 miles in its clock which make you wonder what's it's been up to these past 22 years. He does admit that one of the activities has been gathering some rust in its rear, but that it was just a passing dalliance, and overall the car looks to be swiss cheese-free. It does maintain its double spoiler hatch and rocker extensions, and the seller claims that it has some new parts but doesn't divulge what they might be. He also makes no claim of any mechanical issue or other detriment aside from expected wear and tear of age and typical use. If serious about purchasing this, or any, GTX, things to look out for are transfer case noise - that being an expensive and hard to come by part. Also, the prop shaft joints and rear halves are known to wear and be made of unobtainium today, so that would be a good reason to do the scapula scrape under the car and give a good shake to the round bits. Brakes also can be a repair nightmare on these as the front rotors sit behind the hubs requiring major dis-assembly should a warped disc need a-fixing. But none of that is any reason to stay away from a GTX, although their original price being nearly twice that of a standard 323 meant that buyers used to do so in droves. In fact, this is one of only 1,243 cars ever sold in the U.S., a number that has obviously dwindled due to attrition and hard lives many of them led. As noted, this one seems to have escaped SCCA participation, and hence may not be all beat to hell.Because of that, its $2,900 price tag may seem like a hell of deal, making a potential buyer say what the hell. Of course, that price may be just the entry into what is the new owner's own personal hell as unforeseen problems pop up, and the lack of available parts makes finding replacements a hellish problem. With all that in mind, is $2,900 a great little price? Or, for that much should this GTX GTFO?